First of all, thanks very much for this excellent campaign launch! During the first week of our campaign, we not only surpassed our investment threshold, but we also raised more than 38 % of our funding goal. In addition, our equity crowdfunding campaign has had many other positive effects so far: We have reached far more than 200,000 contacts through social media, and our website and our store's page views have increased more than threefold compared to an average week. At the same time, we are receiving much positive feedback, no matter whether people post a comment, email us, or call us. 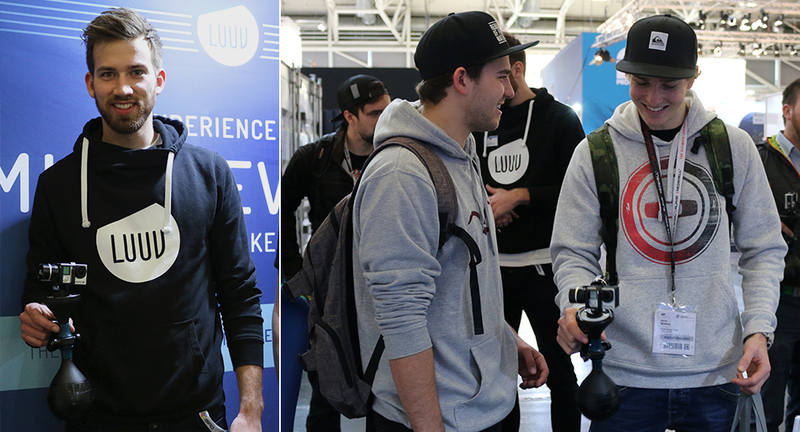 Some of you have also used the opportunity to visit our Berlin office or our booth at ISPO. From 24 through 27 January, we presented our products at ISPO, the world's largest sports business trade show. The acting "Product Of The Year 2015/2016" award winner, we naturally had a home advantage and were simply overwhelmed by the number of people at our booth at times. During the four days we spent at ISPO, we had far more than 500 discussions, thrilled numerous customers, made new international sales contacts, and discussed strategic partnerships with leading camera manufacturers. Our equity crowdfunding campaign has also attracted considerable media attention thus far. Indeed, t3n ran a feature on our company, and Tobias gave an interview to Crowdfundinsider. We are particularly pleased that many of our Indiegogo and Kickstarter backers have decided to also become our investors. In doing so, these people have proven that they have confidence in our products and in our work. Simultaneously, some Companists have contacted us privately in order to invest even higher amounts during our next financing round. We will keep you posted on that. But for now, let's continue focusing on our current campaign together! In addition to your investment, you can support us by activating your private and professional networks and sharing our posts on social media. You can find teamLUUV on Facebook, Twitter, YouTube, Instagram, and Medium. If you are interested in personally trying out our products and meeting our team, please email investor-relations@luuv-stabilizer.com, and we will make an appointment with you in Berlin. PS: Due to the high demand of investors, we have increased the available number of rewards for this campaign.